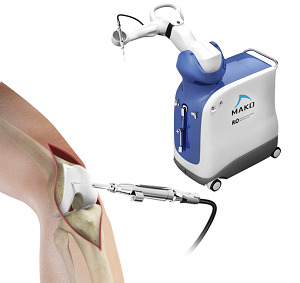 Robotic assisted knee surgery is an innovative technique alternative to the conventional surgical procedure in patients suffering from degenerative knee diseases such as osteoarthritis. It is performed using robotic-arm technology that allows the surgeon to precisely perform the surgery through a smaller incision as compared to traditional surgery. This procedure utilizes X-rays and CT scans to determine the damaged areas of the joint which needs to be removed for the precise placement of the knee implant. The procedure may be used for total or partial knee surgery. During the procedure, the diseased portion of your knee is removed, preserving the surrounding healthy bone and tissue. An implant is then secured over the prepared portion of your knee joint that results in resolution of symptoms and a natural knee movement. As it employs a minimally invasive technique, the incidence of scarring and blood loss is very low.